Dark Chocolate Raspberry Mini Cakes, or Cakettes, if you will. Step 1. 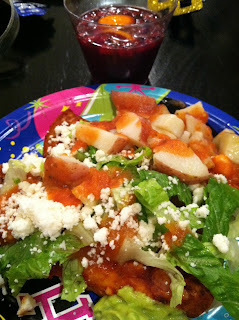 Get invited to New Year's Eve dinner by your friend who is serving homemade enchiladas and sangria. Step 2. RSVP Yes Yes Yes. You never turn down enchiladas. Step 3. Realize you should probably bring something. Step 4. Notice a text from said friend asking you to bake. Preferably chocolate. Step 5. Find out she loves the combination of chocolate and raspberries. Step 6. Purchase necessary ingredients. At 6pm. The party starts at 7pm. Step 7. Text that you'll be a little late. Step 8. Make these Dark Chocolate Raspberry Mini Cakes, neglect to clean the kitchen because you have a party to get to, go to the party, walk in to oohs and ahhs, clean the kitchen the next day as you're watching the Rose Bowl. 1. Preheat oven to 350 Degrees Fahrenheit. Coat two 12-cup muffin tins with nonstick spray. If your muffin tins are old and tend to have things stick in them, or you are concerned about removing the cakes at all, then just use paper muffin cup liners. Simple simple. 2. Beat butter on medium for 30 seconds. Add in sugars slowly, continuing to mix for about 5 minutes until light and fluffy, making sure to scrape down the sides of the bowl. Add in the eggs and mix well. Mix in vanilla. 3. In a separate bowl, stir together flour, cocoa powder, baking soda, baking powder and salt. Alternately add flour mixture and buttermilk to sugar mixture, beating on low until just combined. Once all has been added, beat on high for 20 seconds more. 4. Divide half of batter between prepared muffin cups. Add 3-4 raspberries to each muffin cup. Spoon remaining batter over the top of the raspberries. 1. In a small saucepan, heat whipping cream over low heat until just simmering. Stir continuously. Remove from heat and whisk in chocolate and vanilla, whisking until all chocolate has melted. Transfer to a bowl and allow to set for 5 minutes before spooning over inverted cakes (yes, these cakettes are simply upside down cupcakes). Store the extra covered in the fridge. Add a raspberry on top as a garnish. Serve soon (I served about 45 minutes after garnishing, and the cakes were still a bit warm). If you prefer a thicker ganache, you can cover and chill the ganache for about 20 minutes before spooning over the cakes. Also, if you like a LOT of ganache, use these measurements: 1 Cup Whipping Cream, 1 1/3 Cups Semisweet Chocolate, 3/4 tsp Vanilla, and follow the same instructions as above. the enchiladas and sangria looked like.